I love the watch and am sure my son will be thrilled when it is given to him for Christmas this year. I will update this review after Christmas! 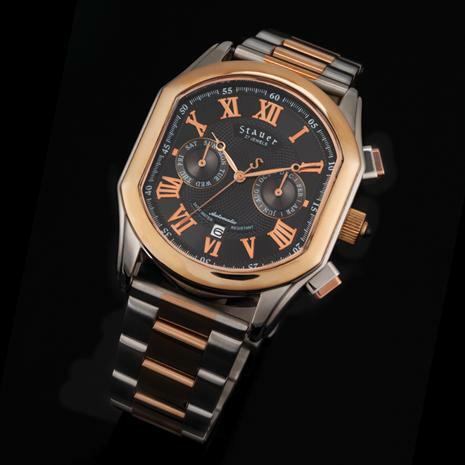 Thank you Stauer for the beautiful watch. Design, functionality, etc. thumbs up. The price is so convenient, the question is, how you can do that ? My husband wanted an idea of what to buy me for our 10th anniversary. I wanted a non battery self winding watch that would work with female jewelry. I also needed it big enough to see the time without my glasses. We've had our watches for months now. Beautiful, sturdy,waterproof, reliable, easy to get on and off,easy to operate the setttings. If you want a classy off the grid dependable watch this is it. P.S. We paid for our watches. This is an honest opinion. Got this watch as a present ,and had a problem ,called customer service and Rene took control had a new one back that works great for our birthday guy ,I got one that works super ,amazed how it keeps the time ,have not reset it now going on three months ,have purchased four other watches and all have been great and look super good on ,always amazed at people who think they cost hundreds more than they did ,recommend to any one who ask ,customer service is best I have ever had!!!!! Over ninety years ago, a watchmaker in Europe famous for building clocks at Versailles created a legendary watch movement. He invented the first watch with an automatic mechanical drive. These innovative movements required no batteries and never needed to be manually wound. Inspired by history, our Stauer Versailles has been painstakingly handcrafted to meet the demanding standards of vintage watch collectors. Every interior dial has been carefully engineered to replicate the “complications” of the earliest multifunction watches. Two interior dials display day and month and are run by a perpetual calendar mechanism. With an exhibition back, you can see into the heart of engineering and witness the 27-ruby jewel automatic movement and see the rotor spin to keep it wound— it’s powered by the movement of your body.